Nostalgic but with an overtone of irony, this hilarious story about the history of NYC wages a personal war against the politically correct. 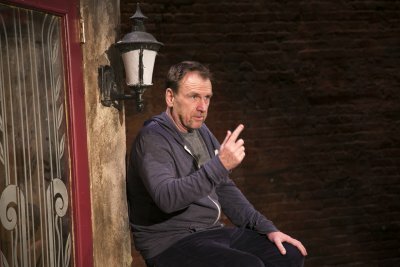 Reaching as far back as the Dutch occupation of the island of Manhattan and all the way up to the neon-ensconced Times Square of today, Colin Quinn’s latest one-man show, Colin Quinn The New York Story, is a journey into the rich history of the five boroughs which make up New York City. In the process, Quinn—a Brooklyn native—tackles everything from poverty to immigration; relationships to racism. Pacing the stage and gesturing wildly while in the middle of an ironic and wildly stereotypical impersonation of the Italians of New York, the quick-witted Quinn is just as likely to change subjects and launch into a tirade about the commercialized New York City of today. Weaving his own life-experience into the story of the creation of the city, Quinn is full of interesting trivia but never gets bogged down thanks to a bevy of jokes which are funny, sometimes hysterical, and almost always offensive. At the performance under review, Quinn seemed to get off to a rocky start but quickly got things under control. Whether it was due to a change in the order of his jokes, or possibly a last minute improvisation, it didn’t take very long for Quinn to recover and launch into the rest of the show at full steam. The show is at its best when Quinn digs into his cynical side, bantering about “the good old days” and commenting on the negative effects of gentrification. Director Jerry Seinfeld is a natural choice to helm this project, he himself a product of Brooklyn. With Mr. Seinfeld’s guidance, Quinn’s show uses many different comedic techniques between its jokes. Physical comedy has a presence, irony is around every corner, and—most importantly—self-deprecation is the anchor that keeps Quinn affable amid his battle against the politically correct. The set design by Sara C. Walsh (assisted by Connor Munion) is conducive to a one-man show, offering very little in the way of moving set pieces, but kept interesting thanks to relics and iconography associated with NYC scattered across the stage. The formidable pair of Jerry Seinfeld and Colin Quinn have put together a comedy act which is (nearly) as fact-filled as it hilarious. 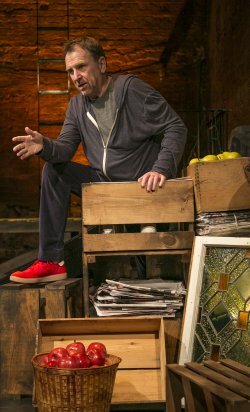 Nostalgic but only by necessity, Colin Quinn The New York Story spares no expense in exploiting the various cultural stereotypes—and resulting idiosyncrasies—that permeate through the history of New York City. Long and difficult, three flawless performances enrich this graceful revival of the 1992 hostage drama where humor coexists with despair in 1980’s Beirut.